“Those of us who nurture the lives of those children who are not supposed to exist, who are not supposed to grow up, who are revolutionary in their very beings are doing some of the most subversive work in the world. If we don’t know it, the establishment does.” – Alexis Pauline Gumbs –Revolutionary Mothering. In a most timely anthology, “Revolutionary Mothering: Love on the Front Lines” a new generation of writers, poets, activists, and mothers elaborate on the powerful evocations of their foremothers to highlight a radical reframing of mothering as a social, rather than biological, “practice of creating, nurturing, affirming and supporting life.” In discussing their editorial work, Mai’a Williams and Alexis Pauline Gumbs, raise the question of what and how it means to mother while at the front lines of resistance in both material and imaginary senses. For Black Women in Northern Cauca, the assault on their ability to care for themselves, each other, their children and their communities, places them on the front lines of countless intersecting fronts. 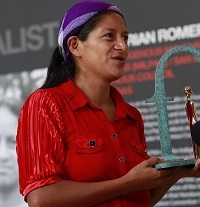 From food sovereignty, to environmental justice; liberatory health systems, to autonomous economies and governance, Black Women in Northern Cauca are desperately struggling to bring to life a future of peace and safety. 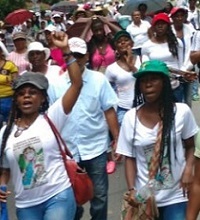 Four weeks ago, the Black Women’s Mobilization participated in three days of protests of organized by the Association of Community Councils of Northern Cauca (ACONC), a regional organization made up by the various black communities that inhabit the region. They faced off against riot police who indiscriminately fired tear gas into homes, leading to the hospitalization of 3 babies. Despite their sorrow, the sisters of the Black Women’s Mobilization continue to participate in regional and national protests. This is the second major protest in which the Black Women’s Mobilization has participated within a month. 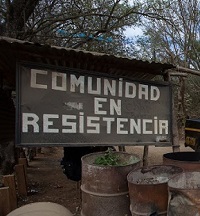 They will continue to participate in regional and national protests, as well as advancing a variety of community initiatives all aimed at ending the destruction of their lands, preventing their assassinations, and ensuring that future generations are able to reside on their ancestral territories.